PARK RIDGE, N.J., Oct. 4, 2013 – At WFX 2013, Sony Electronics unveiled its new SRG line of high-definition, remotely-operated cameras, designed to deliver high-quality imaging, powerful capabilities, ease of use and affordability for a range of commercial applications. The first two models in the new line are the pan-tilt-zoom (PTZ) SRG-120DH and SRG-300H cameras. The new SRG series joins Sony’s widely used EVI and BRC product lines, giving customers a greater choice of high-quality remote camera options. The new SRG-120DH camera is designed for desktop use, while the SRG-300H model is desktop- or ceiling-mountable. They are capable of full HD (1080/60P) imaging, incorporate industry-standard HDMI interfaces, and can be controlled via VISCA™ protocol over IP connections. The SRG-300H also features a 30x optical zoom (the highest in Sony’s PTZ line up) making it perfect for a variety of room sizes and venues in corporate, education, and government. The high-image quality SRG cameras incorporate Sony’s most advanced Exmor™ CMOS technology designed to deliver the highest video production values for broadcast, in-house, or online viewing. 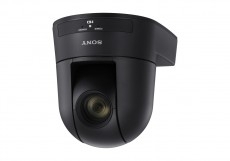 According to Mark Bonifacio, Sony Electronics’ Director of Industrial Cameras, the SRG-120DH and SRG-300H PTZ cameras are especially suited for nearly any remote shooting and monitoring application, including lecture capture, house of worship use, videoconferencing, and telemedicine. ”High quality, high definition video has become an expectation, and the new SRG line is an easy to operate, cost-effective solution for a variety of applications,” said Bonifacio. The SRG-300H and SRG-120DH PTZ cameras both feature a high-sensitivity Exmor sensor and Sony’s latest enhanced features including View-DR™ dynamic range enhancement and XDNR™ technology (eXellent Dynamic Noise Reduction). View-DR provides superb visibility even in challenging back-lit conditions resulting in clear images. This allows the cameras to pan across an area and stay sharp despite shifting from front-lit to back-lit views. XDNR technology reduces noise and provides clear images in both moving and still objects under low light conditions. Another essential feature of the SRG cameras is their easy operation due to new PC control software that enables intuitive operation and full access to camera functions such as color adjustment. The full range of VISCA command protocols are accessible through standard IP connections. The SRG-H300 has RS-232 and RS-422 capabilities, while the SRG-120DH is RS-232-capable). Image E-flip allows the SRG-300H to be used in a desktop position or ceiling mounted while maintaining proper right-left/up-down orientation. Each camera has 16 programmable presets using VISCA so operators can click from one camera shot to another without having to reframe. This allows smooth transitions rather than jarring shifts. The SRG-120DH PTZ camera features a 12x optical zoom and a 12x digital zoom, with a 71-degree horizontal viewing angle. The SRG-300H model combines a 30x optical plus 12x digital zoom with 65-degree viewing angle and is available in both black and white casings. The SRG-300H will be available in November and the SRG-120DH will follow in December with pricing to be announced.